The first race of the day was the Auto Quad class and newcomer Danny Reid did very well throughout the day, out in front though was Jack Duffy and Ben Mackenzie and their season long battle continued with neither lad giving an inch around the tight track, Jack won all three races but they were so close at the end of Race 1 it nearly required a photo finish!! The Auto bike class saw Liam Mackay flying to all 3 wins but it must be said that a dramatic improvement from Jak Murray was certainly visible. The 65cc class were next out on the big track and the dry conditions allowed the riders to really wind up their machines over the undulating course, Lachlan Jardine-Munro, Tom Mackenzie and Ewan Gordon were joined by Daniel Kirk who has recently moved up to this class from the Quads. The 85cc class was combined as usual with a mixture of small and big wheeled bikes, the small wheel class was won by Lewis Kirk, Morgan Robertson took runner up and Ross Gordon was third. The big wheel riders gave an awesome display of speed around the track and it was Jake Anderson who led each race from the start line to the chequered flag, a great performance from Rikki Cormack allowed him a well deserved second place and a day long battle for third took place between the lads from the West, Sam Wordingham from Armadale eventually took third, Lewis O�Brien from Strathnaver took fourth and Kyle Angus got fifth after suffering from mechanical problems. 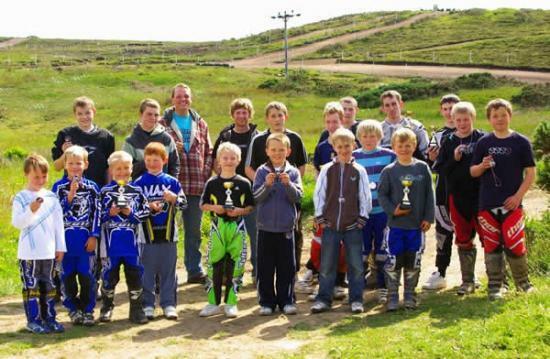 Martin Kirk won the 125cc class and rode well against the adult riders. The Adult class raced close all day and it was Kyle Mackie who won all three races with Iain Nicolson in second, James Ross in third, Kyle Thomson was fourth and Ryan Sinclair in fifth.